Supermarket!!!! It is a large form of grocery store which offers a wide variety of foods and household products that are well organized into aisles. In supermarket business, accurate inventory information is essential as many of the items are perishable with limited shelf lives. If the stocks of fast selling items are less then it will lead into loss of sales and even if the stocks of low selling items are more then it will also lead in loss of sales. So it means properly organized inventory/stocks should be maintained so that items should not be over-ordered or over stocked as it does not scramble the path of grabbing better opportunities. Retail Mass Supermarket POS Billing Software contains such features which distinct the software from other software’s. Retail Mass Supermarket POS Billing Software allows you bar-coding of your products in defined formats as well as user defined formats. Even you can scan and print multiple barcodes. There is a provision of maintaining stocks/ ledgers of multi-location godowns. 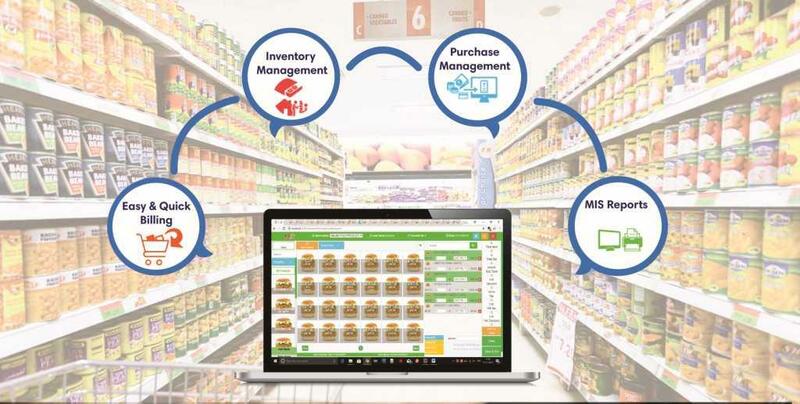 The most beneficial feature of Retail Mass Supermarket POS Billing Software is its Expiry Management- it will show alert of the stocks which are going to expiry soon to avoid loss; also check your physical stock with computer stock which lets you update you stock/purchase/sale data with ease. You can import as well as export data in any format which will reduce your manual work. In Retail Mass Supermarket POS Billing Software, you can preview, print, export reports in any format (.xls, .csv, .dbf, .txt formats) as well as reports can be emailed.